When reporters fail to show compassion, victims of natural disasters suffer more. It's hard to know the right way to cover a natural disaster like Hurricane Harvey, which is still battering the southeastern Texas coast. Weather events that cost lives and destroy cities are huge news stories. Striking the balance between showing the scope of the devastation from a natural disaster while respectfully telling the stories of people who are struggling with their lives being upended can present ethical and moral dilemmas. Luckily, there are some guidelines — like the Society for Professional Journalists Code of Ethics, which asks reporters to "show compassion for those who may be affected by news coverage" in order to minimize harm to people that are not public figures. Unfortunately, some reporters in Houston are apparently unfamiliar with the concept of minimizing harm. If, for example, ABC World News Tonight Weekend Anchor and Chief National Correspondent Tom Llamas had a better handle on the ethics of disaster coverage, he likely wouldn't have tweeted this. Here, Llamas fell prey to a dastardly journalistic trope, one that often presents itself in times of crisis: advocating for the right of property over people. Social media users unleashed rage at Llamas. Llamas tried to back down and qualify his statement, but it was too late. 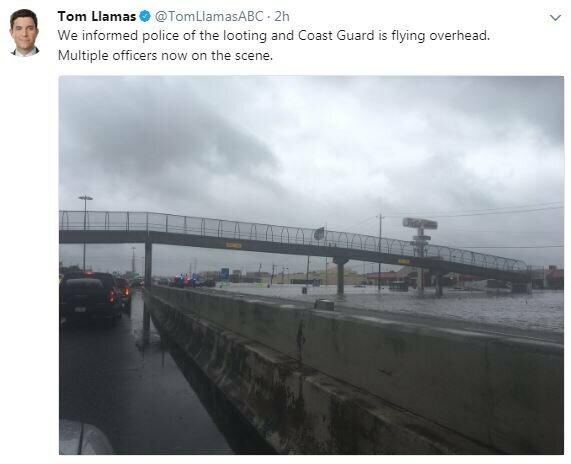 Even if we take Llamas' explanation at face value, the ABC anchor made it seem like emergency resources would be better dedicated to protecting the assets of a store — assets that, given the flooding, were likely a loss anyway — than rescuing people. Llamas was also taking valuable resources away from the mission of rescuing storm victims. A Coast Guard helicopter could be used to patrol for families and individuals who may be near drowning or under duress. Instead, these emergency services were preoccupied with protecting goods in a supermarket. The media has long had a history of feeding the worst prejudicial views of their own reporters into how they cover the news. In 2005, the Associated Press described a black man “looting” a grocery store in the wake of Hurricane Katrina. At the same time, the Agence France Presse described a white couple “finding” supplies at a grocery store. Llamas wasn’t alone in his coldhearted approach to reporting on the storm's human cost. Reporting from a shelter in Houston, CNN's Rosa Flores put her a microphone in the face of a woman who had just arrived at the shelter with her shivering child and asked her how she felt. Reporting on the situation that the victims of Harvey are in is a journalistic necessity. Tragedies must be seen to be believed. But hanging out at the entrance of a shelter and haranguing people coming in from a storm that has destroyed their lives is the definition of “pandering to lurid curiosity” — something the SPJ code cites as an ethical breach. For reporters like Llamas — and, to a lesser degree, Flores — to disregard the feelings and needs of the afflicted shows that their way of covering the storm is one that doesn't care about ethics or comfort. Eoin Higgins is a freelance journalist in Massachusetts.